Maximize the benefits of your 5-axis machine and get more uptime. 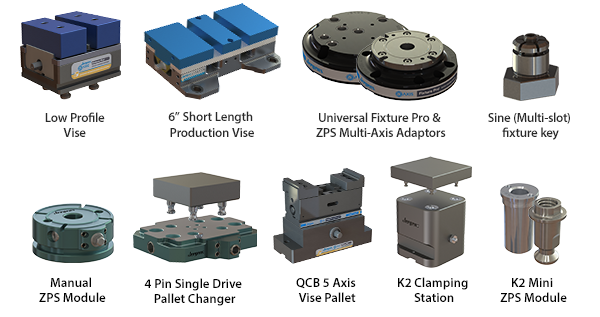 Switch out vises and fixtures in seconds! The stainless steel construction and smart engineering of Jergens Kwik-Lok™ Pins resist corrosion in harsh environments. 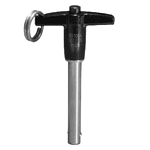 Easy-to-remove, interchangeable shackles are ideal for low-clearance applications, mounting on molds, dies, & fixtures. Today there are more quick change technologies available than ever before for multi-axis, horizontal and vertical machining centers. 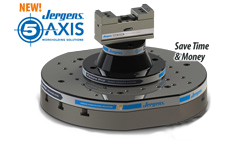 Explore the benefits of broadly implementing a quick change fixturing strategy to achieve plant wide savings in setup and part changeover time with Jergens' Workholding Solutions. 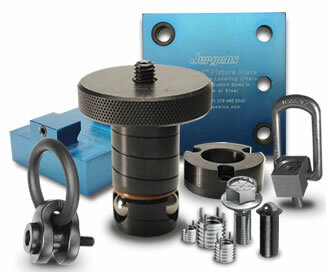 Jergens' components create opportunities to complete multiple operations using the original clamping, again reducing set-up time, but also increasing accuracy and repeatability. Contact us to discover methods for applying your specific needs for improved manufacturing and ROI. Click a Base Camp link above to learn more, or or contact our Value-Added Solutions Team: 1-877-426-2504 or workholding@jergensinc.com. The Jergens website makes finding the right product for your application easy! Select a product using our product search or our product menu at the top of each page. Want more information? See it! View video of our products in action. Videos are available from the Jergens Video Library. Turn it! View 3D CAD drawings of products. CAD drawings are available from product detail pages. Configure it! Online tools like the Kwik-Lok Pins Selector will help you build the right configuration or select the right pin for your application. Get it! Use our Check Stock and Price search to purchase Jergens products online, or use the distributor locator to find a distributor near you. 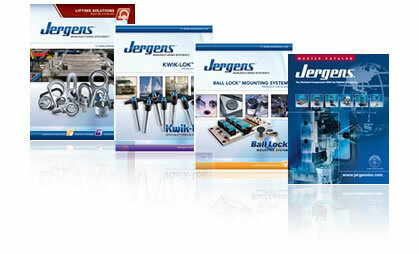 View or download PDFs of all Jergens catalogs and literature. Use our convenient form to request printed copies or CDs of Jergens videos. All Jergens catalogs are available in PDF format. We got our start back in 1942, manufacturing tooling components to help American manufacturers operate quickly and more efficiently. "The Standard Components with the Highest Standards:" This founding philosophy put Jergens on the forefront of the "lean manufacturing" movement before anyone even thought to put those two words together. In the years since, Jergens has structured its offering to advance the cause of leaner manufacturing, adding products and engineered solutions for an integrated approach to "Manufacturing Efficiency." systems like Ball Lock and ZPS.